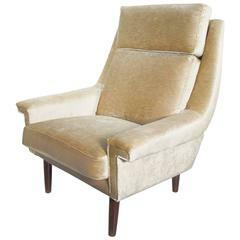 Danish 1950s lounge chair recently reupholstered in shiny light beige velvet. Round stained wood legs. Excellent condition. 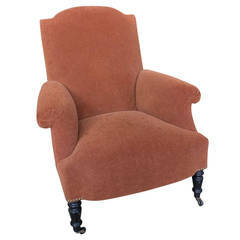 Pair of Italian upholstered armchairs from 1970s covered with rubelli velvet fabric . Measurements: cm 80 x 80 x H 65 (seat Height cm.45) each. • Green upholstery and matching bullion fringe as found • Late 19th century • France Dimensions: • 30.5" W x 33" D x 31.5" H • Seat height: 15" • Seat depth: 22".